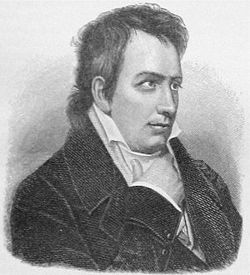 Johann Ludwig Tieck (May 31, 1773 – April 28, 1853) was a German poet, translator, editor, novelist, and critic, who was part of the early stages of the Romantic movement in the late eighteenth century and early nineteenth century. Romanticism was an artistic and intellectual movement that originated in late eighteenth-century Western Europe. In part Romanticism developed as a revolt against aristocratic social and political norms of the Enlightenment period and a reaction against the rationalization of nature. In art and literature, it stressed strong emotion as a source of aesthetic experience, placing a new emphasis on such emotions as trepidation, horror, and the awe experienced in confronting the sublimity of nature. It elevated folk art, language and custom, as well as arguing for an epistemology based on usage and custom. Most of these aspects of Romanticism find their way into Tieck's works. Tieck was born in Berlin, the son of a rope-maker. He was educated at the Friedrich-Werdersche Gymnasium, and at the University of Halle, the University of Göttingen and Friedrich-Alexander-University, Erlangen-Nuremberg. At Göttingen, he studied William Shakespeare and the Elizabethan drama. In 1794, he returned to Berlin, and attempted to make a living by writing. He contributed a number of short stories (1795-1798) to the series of Straussfedern, published by the bookseller C.F. Nicolai and originally edited by J.K.A. Musäus, and wrote Abdallah (1796) and a novel in letters, William Lovell (3 vols. 1795-1796) which describes the moral self-destruction of a young intellectual. These works were immature and sensational in tone. Tieck's transition to Romanticism is seen in the series of plays and stories published under the title Volksmärchen von Peter Lebrecht (3 vols., 1797), a collection which contains the admirable fairy-tale Der blonde Eckbert, and the witty dramatic satire on Berlin literary taste, Der gestiefelte Kater. With his school and college friend Wilhelm Heinrich Wackenroder (1773-1798), he planned the novel Franz Sternbalds Wanderungen (vols. i-ii. 1798), which, with Wackenroder's Herzensergiessungen (1798), was the first expression of the romantic enthusiasm for old German art. In 1798, Tieck married and in the following year settled in Jena, where he, the two brothers August and Friedrich Schlegel and Novalis were the leaders of the new Romantic school. His writings between 1798 and 1804 include the satirical drama, Prinz Zerbino (1799), and Romantische Dichtungen (2 vols., 1799-1800). The latter contains Tieck's most ambitious dramatic poems, Leben und Tod der heiligen Genoveva, Leben und Tod des kleinen Rotkäppchens, which were followed in 1804 by the remarkable "comedy" in two parts, Kaiser Oktavianus. These dramas, in which Tieck's poetic powers are to be seen at their best, are typical plays of the first Romantic school; although formless, and destitute of dramatic qualities, they show the influence of both Calderón and Shakespeare. Kaiser Oktavianus is a poetic glorification of the Middle Ages. He published a collection of fairy tales entitled Volksmarchen under a pseudonym, Peter Lebrecht. Included were some plays based on the fairy tales, including one on "Bluebeard" and another on "Puss in Boots." These plays were a parody on the prevailing rationalism of the eighteenth century Enlightenment. In 1801, Tieck went to Dresden, living for a time near Frankfurt (Oder), and spent many months in Italy. In 1803, he published a translation of Minnelieder aus der schwäbischen Vorzeit, between 1799 and 1804 an excellent version of Don Quixote, and in 1811 two volumes of Elizabethan dramas, Altenglisches Theater. From 1812 to 1817 he collected in three volumes a number of his earlier stories and dramas, under the title Phantasus. In this collection appeared the stories Der Runenberg, Die Elfen, Der Pokal, and the dramatic fairy tale, Fortunat. In 1817, Tieck visited England in order to collect materials for a work on Shakespeare (unfortunately never finished) and in 1819 he settled permanently in Dresden; from 1825 on he was literary adviser to the Court Theatre, and his semi-public readings from the dramatic poets gave him a reputation which extended far beyond the Saxon capital. The new series of short stories which he began to publish in 1822 also won him a wide popularity. Notable among these are Die Gemälde, Die Reisenden, Die Verlobung, and Des Lebens Überfluss. In later years, Tieck carried on a varied literary activity. Reinvigorated by an appointment as an advisor and critic at a theater in Dresden in 1825, where over a period of nearly two decades he produced several volumes of criticism (Dramaturgische Blätter, 2 vols., 1825-1826; Kritische Schriften, 2 vols., 1848), he also wrote a series of more ambitious historical or semi-historical novels on a wider canvas. They include , Dichterleben (1826), Der Aufruhr in den Cevennen (1826, unfinished), Der Tod des Dichters (1834); Der junge Tischlermeister (1836; but begun in 1811) is an excellent story written under the influence of Goethe's Wilhelm Meister. These works contain polemics against both the young Romantics and the more radical Young Germany movements of his day that were seeking to create a German theater based on democratic ideals. Tieck's Vittoria Accorombona (1840), the story of Vittoria Accoramboni written in the style of the French Romanticists, shows a falling-off. He also edited the translation of Shakespeare by August Wilhelm Schlegel, who was assisted by Tieck's daughter Dorothea (1790-1841) and by Wolf Heinrich, Graf von Baudissin (1789-1878); Shakespeares Vorschule (2 vols., 1823-1829); the works of Heinrich von Kleist (1826) and of Jakob Michael Reinhold Lenz (1828). In 1841, Friedrich Wilhelm IV of Prussia invited him to Berlin where he enjoyed a pension for his remaining years. He died on April 28, 1853. Tieck's importance lay in the readiness with which he adapted himself to the new ideas which arose at the close of the eighteenth century, rather than in any conspicuous originality. His importance in German poetry is restricted to his early period. In later years, it was as the helpful friend and adviser of others, or as the well-read critic of wide sympathies, that Tieck distinguished himself. Tieck also influenced Richard Wagner's Tannhäuser. It was from Phantasus that Wagner based the idea of Tannhäuser going to see the Pope and Elizabeth dying in the song battle. Tieck's Schriften appeared in twenty volumes (1828-1846), and his Gesammalte Novellen in twelve (1852-1854). Nachgelassene Schriften were published in two volumes in 1855. There are several editions of Ausgewählte Werke by H. Welti (8 volumes, 1886-1888); by J. Minor (in Kirschner's Deutsche Nationalliteratur, 144, 2 volumes, 1885); by G. Klee (with an excellent biography, 3 volumes, 1892), and G. Witkowski (4 volumes, 1903) and Marianne Thalmann (4 volumes, 1963-1966). The Elves and The Goblet was translated by Carlyle in German Romance (1827), The Pictures and The Betrothal by Bishop Thirlwall (1825). A translation of Vittoria Accorombona was published in 1845. A translation of Des Lebens Überfluss (Life's Luxuries, by E. N. Bennett) appeared in German Short Stories in the Oxford University Press World's Classics series in 1934, but the wit of the original comes over more strongly in The Superfluities of Life. A Tale Abridged from Tieck, which appeared anonymously in Blackwood's Edinburgh Magazine in February 1845. Briefe an Tieck were published in 4 volumes by K. von Holtei in 1864. See for Tieck's earlier life R. Köpke, Ludwig Tieck (2 volumes, 1855); for the Dresden period, H. von Friesen, Ludwig Tieck: Erinnerungen (2 volumes, 1871); also A. Stern, Ludwig Tieck in Dresden (Zur Literatur der Gegenwart, 1879); J. Minor, Tieck als Novellendichter (1884); B. Steiner, L. Tieck und die Volksbücher (1893); H. Bischof, Tieck als Dramaturg (1897); W. Miessner, Tiecks Lyrik (1902). Kertz-Welzel, Alexandra. Die Transzendenz der Gefühle. Beziehungen zwischen Musik und Gefühl bei Wackenroder/Tieck und die Musikästhetik der Romantik. Saarbrücker Beiträge zur Literaturwissenschaft, no. 71. Ph.D. Dissertation (Saarbrücken, Germany: Universität des Saarlandes, 2000). St. Ingbert, Germany: Röhrig Universitätsverlag, 2001. ISBN 3861102781. Boesch, Bruno, (ed.). German Literature: A Critical Survey. London: Methuen & Co., 1971. This page was last modified on 3 August 2018, at 16:48.